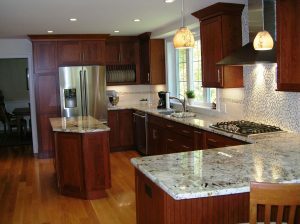 Kitchen islands are a very popular and modern design choice in kitchen remodeling. If you have the room in your existing kitchen, having one professionally installed can be a great investment in your home and its equity. However, there are positive and negative aspects of adding a kitchen island in your home that you should consider before making your decision. They’re Versatile: Kitchen islands can be use for a variety of things, from an alternative eating area and book storage to a homework nook for kids and a space for wine storage. They Provide Extra Counter and Drawer Space: One of the biggest reasons to consider a kitchen island during your kitchen remodeling is the extra space it will add to the room, which can make a dramatic difference. The will make it easier to store kitchen accessories and give you an area to prep your meals. They Can Be Customized: When an island is being professionally installed, you have much more freedom to customize it to your specific style and to complement the rest of your kitchen and home. They’re Expensive: Kitchen remodeling costs are often very high due to the nature of the renovations. From new cabinets and flooring to updated appliances and even additional plumbing installation, your budget may not be large enough to include a pricy kitchen island addition. They Take Up a Lot of Room: While they do create counter and drawer space, kitchen islands are also cumbersome and will take up a lot of real estate in your kitchen. If your kitchen isn’t open concept, you may find the lack of room too limiting. They Can Disrupt the Flow: These large additions can make it difficult to function in your kitchen as you did before. This obstacle to your cooking efforts can make accessing the refrigerator, sink, and stove difficult and awkward. Now that you understand the pros and cons of a kitchen island installation and have decided it’s the right choice for your home, contact a trained and licensed professional and start your kitchen remodeling today.